I feel incredibly awful for the long absence but I had good reasons! I finally finished, printed and submitted my second master thesis to my university here in Germany, I started working fulltime for the time being at my old part-time job and I am also working as a freelance journalist for a website called Japanista, which is trying its best to share exciting stories and news about Japan to the world! :) My first article got published this week and I am also finishing up the second one. As you may or may not know, I have been wanting to become a journalist for quite some time (hence my favorite hobby, blogging!) so I am forever grateful for the opportunity to work with these people and share some of my Japan experiences with the world. 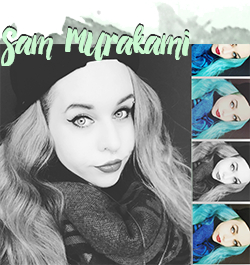 Today however, I want to share with you a thorough guide on how I achieved my grey hair color. Ever since I announced the change, many people were asking for the "how to" and specific product recommendations, so I decided to write the most complete guide I could think of. I have read countless blog posts and watched various youtube videos on how to achieve grey hair and what would the best products be to use but I always was left with many questions afterwards, which has been the inspiration for this post today. 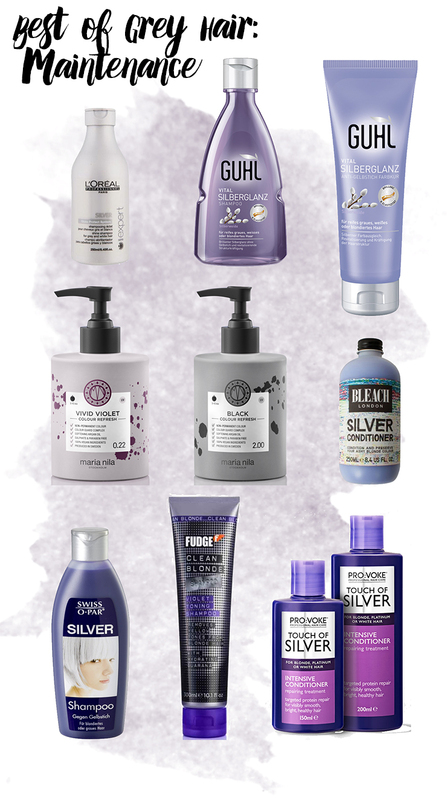 In this guide, you will find a guideline on not only how to achieve the grey hair color, but also how to maintain it as well as specific product recommendations for achieving and (more importantly!) keeping the color. Grey is the sibling that always gets into trouble in the hair dye family, so let's get started. Grey hair is an extremely high maintenance color. And take this from someone who had every haircolor under the rainbow: If you thought a vibrant red or green is hard to keep, this is even harder. It is not, and can never be, a permanent hair color and will fade (quite significantly) every time you wash your hair. If you are not that much into taking care of your hair and experimenting with colors and toners, this hair color is probably not for you. In order for the grey hair color to be visible and even in your hair, you will need to get your hair to as light as possible. However, I strongly suggest you go light in stages over the course of a couple of months, especially if your hair is darker and has been processed with hair color before. The hardest will be if you have had black/dark tones dyed in your hair and if your hair has been dyed red or has a warm undertone as the bleaching process will go over orange and yellow first before you reach a light ashy blonde. It is crucial to not overbleach your hair too fast or you will not only end with fried ends, but possibly with a lot of breakage that will lead to very short hair. Don't do this. Ever. Be patient and treat your hair nicely if you want to keep it. As for the lightness, the lighter the hair is, the more true your grey can shine. Ideally, your hair would be almost white to function as a blank canvas for the hair color. However, my hair unfortunately is not white (yet). In fact, my hair is a light blonde on top and a more yellowish blonde with even a bit of light brown left in the lengths. It is totally possible to get grey hair with a more beach blonde hair color, BUT: What will happen are two things: First, almost all grey hair dyes are made with blue tones to cancel out the brassiness of the hair. However, yellow and blue, if you paid attention in art classes, will be turning into....yes, green. So if your hair is too brassy, you'll risk getting a very distinct green hue in your hair. If you hate this, then I strongly suggest you either lighten your hair further or use a white toner in between to minimize this effect. Second, the fading grey hair color will look weird and uneven if your blonde is too dark. If your hair is white, the grey will beautifully fade over every possible grey shade there is (I am consciously not including a 50 Shades of Grey joke here...) but if your hair is yellow underneath, it will become visible after a few washes which doesn't look too pretty in combination. Grey hair color fades extremely fast so if you want to keep the vibrant color in your hair, your best bet is to keep washing it to a minimum. I was blessed with non-oily hair, so for me washing it once a week is sufficient enough and it keeps the color alive for a much, much longer time. It always irks me when people rage about how fast their color fades yet hear that they wash their hair nearly every single day. Sorry, but that isn't going to work out in combination. My personal recommendation would be once a week, but if you can't do that keep it to twice a week MAX or you will spend a ridiculous amount on color-saving and -depositing treatments. If your hair tends to get oily fast, you can use dry shampoo in between. Your hair will eventually get used to being washed less and should become less oily over a certain amount of time! You might be compelled to style your hair into gorgeous curls or straight hair to show off your new awesome color but I advise to keep styling heat to an absolute minimum as your hair will already be damaged by the bleaching process. If you're styling your hair everyday, it will very likely become super dry and break at the ends which isn't pretty at all. I usually let my hair air-dry or dry it a bit on low heat with the blow dryer and then adjust the day after with a straightener if I really need to. I've always been too lazy to use a curling wand, so I usually resort to breading my damp hair overnight if I'm in the mood for wavy hair. Salon visits are expensive and grey hair fades fast (did I stress this fact enough yet...? 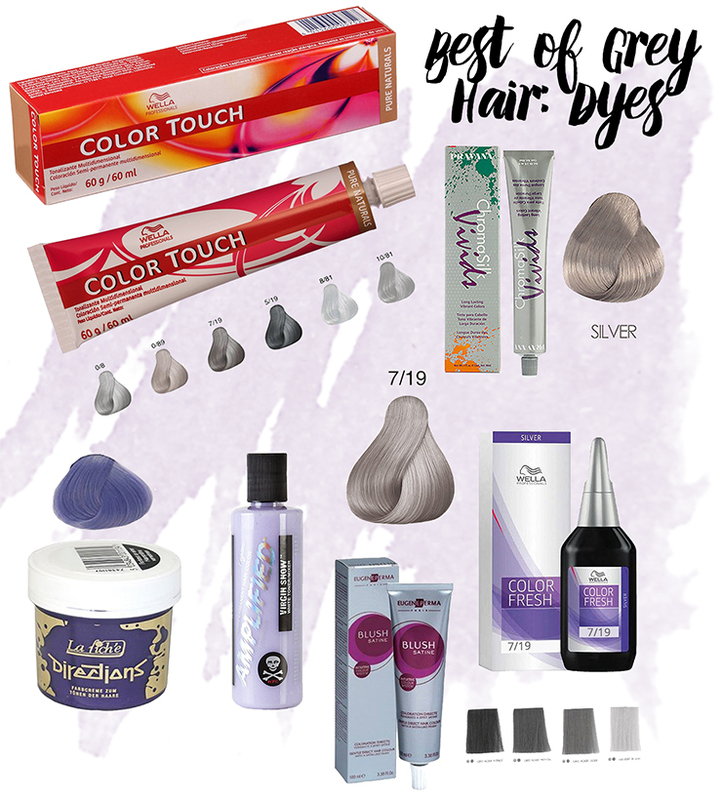 ), so in order to maintain the hair color, apply silver-, purple-, or gray color-depositing products and let those be absorbed for 5-30 minutes (depending on the product and how your hair takes it, start with 5-10mins and work your way up until you reach the desired hair color.) I had good experiences with the Maria Nila Colour Refresh line (vegan haircare produced in Sweden!) and an overall favorite seems to be the Fudge Clean Blonde Violet Toning Shampoo and Conditioner - see below for full list of recommendations! My hair grows very fast (bless my hair!) so I have distinct dark roots showing up that start to bother me around the 4 week mark. Since I'm still a poor grad student, I alternate between professional salon visits and bleaching my roots at home with the help of a friend. If you have no knowledge about bleaching hair though, I strongly recommend you get it done at the salon or educate yourself about the bleaching process in order to not completely mess up your gorgeous grey hair. (anyone interested in an intensive guide about bleaching...?) I wouldn't do it myself if I didn't have friends who knew exactly what they are doing. I hope this post was helpful for you! If you still have any questions left, please feel free to shoot me all your questions down below in the comments section. If I missed anything important, or if I discover any new amazing products, I'll make sure to update this post in the future.